Tome of the Undergates is a book in the Science Fiction genre written by Sam Sykes. The book was published by Pyr on 2010-09-07 and contains 447 pages. The book has an ISBN number of 978-1616142421. Our users found the overall impression of this book to be Exciting. 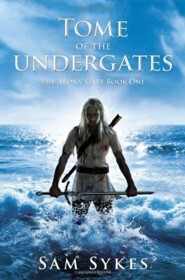 Tome of the Undergates is the first book in the Aeons Gate fantasy series. It is also the first novel released by Sam Sykes who, at only twenty five years of age, is another in the current line of up and coming young authors in the fantasy/science-fiction genre. The storyline of the book is very basic. A group of mercenaries board a ship with the assignment of protecting a Priest. Somewhat quickly into their journey they come under attack and during the scuffle they lose the titular Tome of the Undergates. The mercenaries spend the remainder of the book tracking it down. One of the primary plot points is that the mercenaries cannot stand each other and its mainly up to their leader, Lenk, to keep them all in line and focused on the tasks at hand. The characters are very compelling, each one unique and interesting in their own way and with their own special abilities. For example, Lenk is "possessed" by a spirit while another member is described as a "dragon man" and yet another is skilled at archery, etc.. The tone of the novel is very dark, with conflicts comprising upwards of seventy five percent of the tale. However, these conflicts were not as violent or gruesome as one would expect and some additional fleshing out of the main storyline would have been nice. Also, I feel I have to mention that some of the humor in the book was just horrible. It seemed targeted more towards children than anything else (some of the jokes are the very definition of "potty" humor). This might be due to the author's young age, but given the subject matter it didn't fit in very well with the overall theme of the book. Finally, although a lot of effort was put into the characters to make them interesting, the world which they inhabit was not given the same courtesy. I personally found this very disappointing as some of the concepts in the novel have such promise. Overall, I would say this is an okay first effort by an unproven new author. Hopefully the remaining books in the Aeons Gate series have a bit more substance. If you are interested in the subject matter you may as well give it a read - its not a bad novel by any stretch, its just not as good as some of the other "new" authors in the fantasy genre. This book lies squarely in the "average" category but has great potential for future books in the series.